Ghost Light Theactricals launched their 12th season with two one act plays: Endgame by Samuel Beckett, directed by Rob Rass-Bergquist and NDGM as an imagined 2nd Act to Beckett’s play by Zachery Hewell and directed by Emily Harvey of Blood Ensemble. Yes, Endgame is a one act play, but the act lasts 90 minutes. Tacking on an imagined 2nd Act that also ran over an hour made for an overly long evening. Endgame refers to that part of a chess game when most of the pieces have been captured. For Beckett, this play is set in the bleakest of futures when most of the Earth’s resources and human populations are depleted. Kasia Rozanska’s scenic design of gray walls with pealing paint and smudges gives us the impression of being inside the crumbling mansion of a wealthy survivalist. Hamm (Craig A. Bradshaw in a stellar performance) seemingly is the Most Important Person, and lords it over Clov (Matthew C. Gilbert, also brilliant) his servant, as well as Nagg (Steven Sterne) and Nell (Melissa Fenswick). Nagg and Nell live inside a pair of wooden shipping boxes and are legless due to a tandem bicycle accident; Clov walks with a stiff twisted leg; and Hamm is blind and confined to his chair. Without a vibrant community, doctors, good food, fresh air, etc., the denizens of this dreary den are perpetually suffering from their deficiencies. There are 3 main types of game rules: rules about what is permitted, rules about what is forbidden or illegal, and rules about how to change the rules. The only one that has enough mobility to break the rule “thou shall not leave” is Clov, but there no certainty that he will survive in the harsh Outside. Hamm must be in control; Clov must obey. But, as with any dominant-submissive relationship, Beckett makes it very clear, and the direction and acting here really brings it out, that Clov is no robot and has a great deal of discretion. One running bit is Hamm yelling for his painkiller and Clov repeatedly yelling back to him it is not time yet. Who is really in control, eh? After the intermission, Blood Ensemble’s NDGM shows what a second act might look like. In contrast to Endgame, game rules were brought out into the open. It’s another survivalist house, this time with 5 people: Jethro (David S. Klein), Speck (Pearl Klein), Baile (Henry James Walker), Tille (Christina Alexander), and Frisbee (Carrie Cates). They engage in a series of games such as Confession, Trial, Tell, Truth or Dare, and other games involving dice, cards, and tying one another up. Apparently, in this house there are no rules against violence, and no way to stop the games. A great deal of this play appears to be variations of theater games actors use to warm-up or as prompts for improvisation. The ensemble has an easy comfort with one another and during the intentional random parts the slight increase in alertness was palpable. In both plays the tech crews performed flawlessly. If you like Beckett, this Endgame is worth the trip to Ballard. If you have the stamina this pair of plays is an interesting study in contrasting ways to explore the theme of isolated survival after the world has gone to pieces. More information about the Seattle Beckett Festival can be found at: www.seattlebeckettfest.org. The Beckett Festival spans 5 months and involves 15 local theatres and colleges, presenting well-known plays like Endgame and Waiting for Godot as well as many of his short plays and radio dramas. 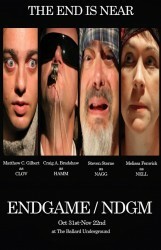 Endgame by Samuel Beckett, directed by Rob Raas-Bergquist and NDGM by Zachery Hewell. Ghost Light Theatricals and Blood Ensemble. Ballard Underground, 2220 Market St. lower level. Total run time: 3 hours. Oct. 31 – Nov 22, 7:30 PM, with a 2 PM matinee on Sunday Nov 9. Tickets: 206 395.5458 or ghostlighttheatricals.org. Ends Nov. 22.